I shouldn’t be even be thinking this I told myself. But that didn’t change that fact that I was. The parade of beautiful women, most 20 years my junior, sent my mind reeling. How did they get so…perfect? To be honest, my thoughts caught me off guard. Of all things! Body Image – a topic I often speak and write about. Why was I thinking these thoughts? I had allowed my mind to put me at the gate. In Acts 3:1, Jesus’ disciples, Peter and John, were on their way to the temple to pray when they saw a man crippled at birth. Every day this man was put outside a gate named Beautiful, leading into the temple courts. There he begged for what he needed. The crippled man had a need and he looked to others to meet it. The name of the gate struck me. I immediately thought of us women. We, too, are “put every day at the gate called Beautiful”. Sometimes, it’s by choice. The gate called Beautiful might be called our closet, mirror, or make up bag. We look to these things to give us what we need. For others the gate is our friends or the man in our life. The gate called Beautiful might be the scale we hope will tell us the “right” number, the gym we join to become the “right” size or the mall we cruse through looking for the “right” outfit. We go to the gate Beautiful. Sometimes, we don’t choose to go to the gate. Ads, TV and social media constantly confront us with society’s beautiful. And like the man put at the gate every day, many of us are crippled too. Crippled at birth, the man didn’t do something to disfigure himself. He couldn’t prevent it. His maiming had everything to do with his birth. For many of us, the way we are crippled isn’t our fault either. Daily, living in a culture obsessed with perfectionism, we’ve been damaged. If we get a new outfit, we expect others to notice. A new hair style deserves a compliment or two. When he took the hand of Peter, the one bringing Jesus’ healing, he stood up. Became strong. That is what Jesus wants for us; for you! To become strong; a woman no longer crippled by culture’s standards. Who takes Jesus by the hand to become healed! Friend, if we take Jesus by the hand, allowing Him to heal our distorted view of beautiful, others will notice. Seeing our new-found confidence, they will be in wonder and amazement at what has happened to us too! 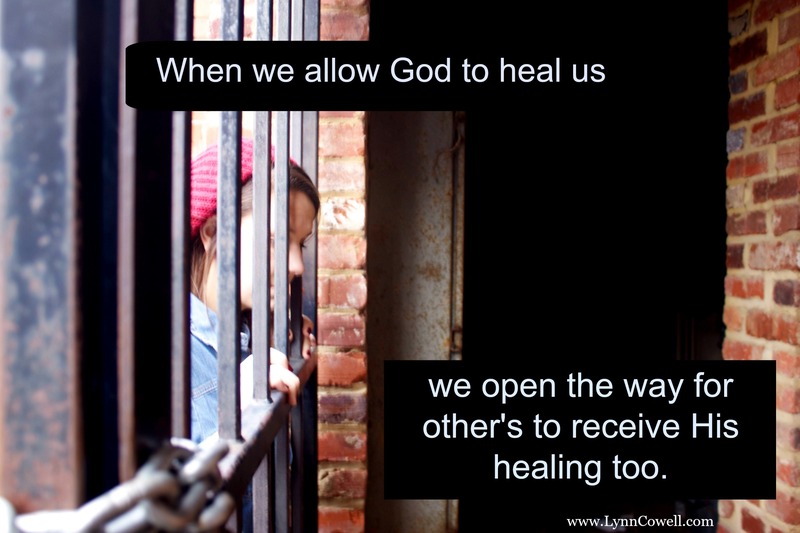 When we allow God to heal us, we open the way for other’s to receive His healing too. Let’s say: no more. It’s time we stop letting culture “put us at the gate” and grasp this: God says we are beautiful. Like the crippled man, let’s take the hand of healing. I have decided to take Jesus by the hands. Many people are trying to understand me while some want to also be like me. I pray for the grace never to leave His hands. To hold on tight no matter what. Ahhh. Thank you for re-directing the thoughts this morning. Our identity is found in Him, and Him alone. Thank you for continuing His message to me. I am so thankful to trust this is exactly the way God created me to be. absolutely perfect in His sight. Thank you for encouraging all who read your post. The world screams at us daily, doesn’t Dottie? Thank you Jesus for redirecting our thoughts to truth! What a wonderful post for today. I have a weight problem, I am obese. I have always had a weight problem, and I have been at my goal weight a number of times, but now it has come to be out of control. I need to remember that this is not the only characteristic that describes me. I need to constantly grasp for Jesus’ hand so that I can walk through this, but the person I am is not different from the one who would be thinner. So for my health’s sake, and not for beauty’s sake, I need to live into asking for help daily and cease berating myself and calling myself names. I wouldn’t call anyone else names and would say similar things to them. I know that with the help of our God I can come to better realize that I am beautiful and don’t need to be disabled by thoughts of negativity. Amen, Cindy! Uneven today, with the words you have typed, you are choosing not to be “put by the gate”! OH WOW!!! Very thought provoking Lynn! Beauty in the eyes of the beholder…we ALL are beautiful in Gods eyes! Thank you Thank you! Lynn, I love this post. Years ago, I spent far too much time tanning my skin and being very happy with my size 0 -3 frame…happy with how “beautiful” I looked on the outside, but then life happened, I became more and more in love and in relationship with Jesus and began experiencing true beauty on the inside, from the inside out… I stopped trying to artificially “brown” my skin and even though I remained petite and still a size 0 -3, it was really just how God made me. Now I am 57 and age is beauty to me…simply because God loves me just the way He made me! Oh how much I pray for younger women today to see the beauty of God’s Creation in themselves! You are a blessing to a future generation of beautiful daughters of our Father! God bless! I pray that God will call more and more of us to be the voice that takes THIS truth to the next generation so that won’t learn it as they grown older, but will become secure in Jesus now. Thank you so much for this wise and encouraging devotion! I had never looked at this passage that way. It is my daily prayer that my girls will find their identity in Christ, but I needed to hear this message, too! It is so easy to get caught up in being enough. I often feel that no matter what I do it is not enough. I realize this is not of Christ. How can I draw closer to Jesé? By listening to His voice and tuning out the world. This will require tremendous amounts of prayer and Bible reading. BUT the result will be worth the effort.